I have been doing wireless for some time, and while some day I hope to be as skilled as Steve the @wifijanitor so a quick plug for Steve. It seems every day you learn something else, and sometimes it comes as an embarrassing and unnecessary TAC ticket which response reads like “Yep, that’s by design, read this” and you end up feeling like “Gosh I should have known that”. If you are like me, and have a single Meraki AP at some sites, or have a single Meraki AP in a lab or home — keep reading, there is something important here. Interesting – I have an 1140 in my lab, and I had the same problem as well, so I started to investigate more. That is good question! So off to a support ticket I went – ok ok ok, I could have googled it more, but we do pay for support right? It was the end of the day, I had somewhere to be, and I figured I would let support school me a bit. 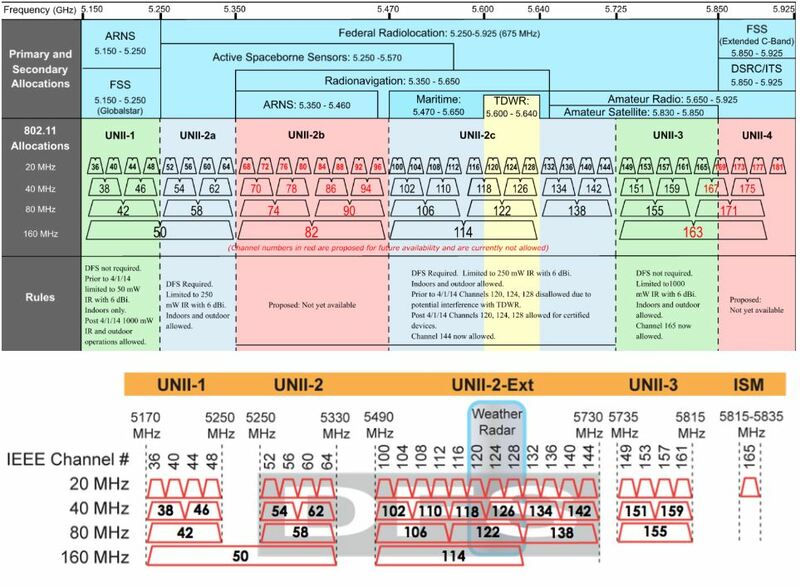 If we discuss 20mhz channels, UNII-1 channels 36-48 are POWER LIMITED by the FCC because of all the users in that band. For indoor applications you are limited to 17 DBI or only 50mw Ouch! The other problem, is that in 2 of my dashboards at sites with only a single AP, and one with only 2, I caught the channel planner using UNII-1 Channels 36-48 by default! I would like to point out, all of these sites had no other channel noise or problems that would cause the AP to channel switch due to noise. Why would the dashboard choose these low power channels by default? You would think they would start at least in the band that allows 24Dbm, or even the higher channels that support 30DBm – especially if I specified always use 100% power, you would think it would chose the channels where it can run higher power. Instead by default it chose the lowest power channel option. By now the solution is pretty easy, hard code your channel, and hard code the power – and you are good. Choose a channel that is not 36-48, and you can get 100mw, if you go into the UNII-3 channels you can even go to a full 1W, but with 100mw clients this may not help you and just wipe out that channels to neighbors. This works ok in quiet environments (My lab is in the country, 1000 yards from anything else, my noise floor is super low), however this may cause problems in other environments. Also keeping in mind pushing 30Dbm – 1W of power on channel 161 may do you little good if clients operate at 100mw so simply pumping the power to full blast may not be advantageous or the best idea. The other problem is hard coding channels makes the rest of the “AUTO” AP’s do funny things. As you know the Meraki dashboard has a “Make a wish” option – please go in there and request the following “Please allow individual channel or band blocking or allow” I have run into other clients where customers need specific channels barred, or bands barred because of other devices in band (Zigbee on 2.4ghz as an example) so this feature is needed for more than just this situation.